Great War Wednesday: Jutland | "Granny Beads and Grocery Store Feet"
For two years, the British Grand Fleet and the German High Seas Fleet had, at best, played a dangerous game of tag with each other. The two navies engaged in small scale battles at places like Dogger Bank, but even then, the action was limited to cruisers and other smaller surface vessels. 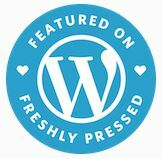 Since the beginning of the war, the mighty battleships of both sides as well as each side’s vaunted battlecruisers had either remained in port or far away from any gunfire. On the one hand, it seems strange the two navies would be so reluctant to come to blows since, arguably, the German navy was one of the pivotal events leading up to the war in the first place. Since the decline of the Spanish Empire in the late 17th century, one thing was clear in all countries’ foreign policy — Brittania Ruled the Waves. The Royal Navy was unmatched in size, power, and victory by the time Kaiser Wilhelm II decided to build a German Navy. Britain was so focused on having the preeminent navy in the world she had enacted the Two Powers Act. This was a British law which demanded the Royal Navy be superior in size to the next TWO largest navies in the world COMBINED. That wouldn’t have affected much in the rest of the world, BUT, the Kaiser wanted a navy to rival the Royal Navy. He’d spent a great deal of time around the ships of the Royal Navy, seeing as he and the King of England were first cousins, and he mightily wanted to emulate the grandeur of the Royal fleet. So he started building battleships and battlecruisers at a phenomenal rate. Britain saw this as literally an act of aggression on Germany’s part and so the first huge arms race of the 20th Century began. Once each side had those glorious navies filled with dreadnoughts and battlecruisers, however, they were loathe to actually send them out. The reason for this reluctance is actually quite simple and economic. Those ships were called “capital ships” for a good reason; a tremendous amount of a nation’s capital went into their construction. Each ship was massively expensive and the last thing either the British or the Germans wanted was to engage in a huge ship on ship battle where they might lose one or more of these horrendously costly vessels. An old joke in navies around the world is the captain always goes down with his ship because it’s easier to die than face a board of inquiry. 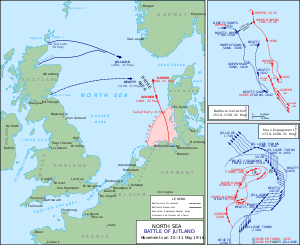 All this feinting and dilly-dallying ended on 31 May – 1 June 1916 in the North Sea off the Danish peninsula of Jutland. For the first and last time in the war the Royal Navy and the Kriegsmarine would face off mano y mano and the result would be . . . inconclusive. Much more brilliant minds than mine have authored scores of books about what happened to lead to the Battle of Jutland so this will only be a glance at an amazing subject but the gist of how the battle started is both sides thought they were leading the other side into a trap using parts of the fleet as bait. By the time everyone involved figured out the trap was mutual, both fleets were in parallel battle lines and as the saying goes, all Hell broke loose. In a battle full of famous moments, one in particular which stands out is the fate of the British battlecruisers on the first day. Battlecruisers were an experimental ship at the time. Essentially, they traded armor for speed. They carried guns the size and range of the dreadnoughts of the time, but their armor protection was quite thin, especially over the deck. This thin top armor made the battlecruiser vulnerable to “plunging fire” as three British ships found out in rapid succession. The battlecruiser squadrons of the two fleets made first contact. The Germans had the range advantage and were, though the British hated to admit it, better shots at sea. As a result, they quickly scored heavy hits on HMS Invincible causing her magazine to explode killing all but a bare handful of men. Not long after, HMS Queen Mary suffered a similar fate as heavy plunging shells detonated her magazines and sent her to the bottom. Later in the day during the famous “Run to the South” when the British battlecruisers tried to retreat to the safety of the main fleet, HMS Indefatigable suffered the now infamous magazine explosion destroying her and killing all but two of her crew of 1200. Two other battlecruisers, HMS Lion and HMS Princess Royal narrowly missed similar fates and were saved from magazine explosions only by the heroic efforts of two Victoria Cross winning sailors who flooded the magazines at the cost of their own lives. The spectacular explosion of so many of the vaunted battlecruisers in such a short period of time prompted British squadron commander Admiral Beatty to remark, “there seems to be something wrong with our bloody ships today.” The second day would see the dreadnoughts take their turn in battle and though many delivered and received heavy hits, neither Britain nor Germany lost one of the major battleships. By the end of the second day, darkness obscured the sea and the ships broke off attack. The Germans slipped away under cover of night and the British seemed more than willing to let them go. To this day, the Battle of Jutland is debated as to its effect on the war as a whole and even on who actually won the battle. Both sides claimed victory. The Germans lost eleven ships to Britain’s fourteen, and the British lost nearly 4000 more men, BUT the British still controlled the North Sea and could still effectively blockade any attempt to get food to Germany through those waters, which steadily increased the pressure on the German Homefront. However, the heart of Germany’s fleet escaped. As long as the High Seas Fleet survived, it remained a source of constant worry to the British war planners. What the British could not know though is Jutland slaked Germany’s thirst for naval battles. She simply could not risk losing her ships while Britain had sustained incredible losses but still had more than enough naval power to meet Germany on equal footing. If the Battle of Jutland had one agreed upon result it was this — the German High Seas Fleet, pride of the Kaiser, would never again sortie from port. After Jutland, German naval policy would focus strictly on the U-boat, with dire consequences for both sides.